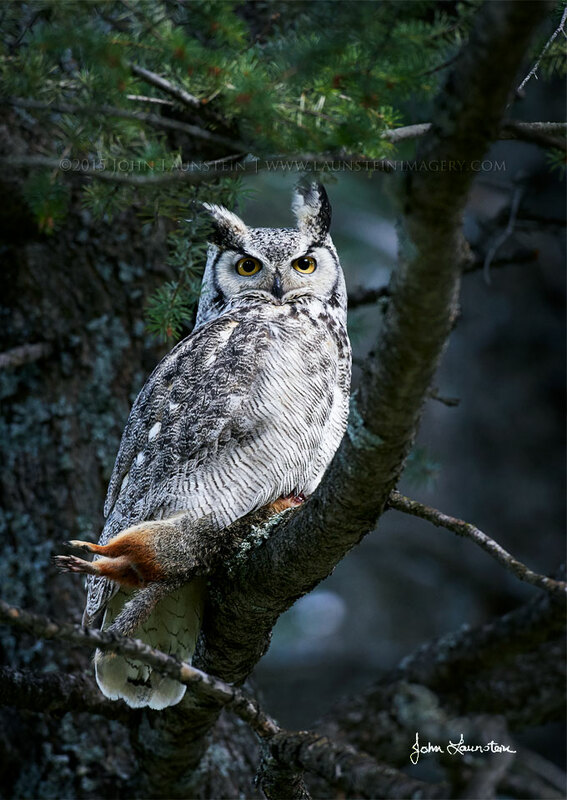 John and his family were camping in Waterton Lakes National Park when Marlise spotted this stunning white-morph Great Horned Owl. As the father of a young owl family (tucked safely in their nest several hundred metres away), he had been busy hunting the resident ground squirrels. Although a bit gruesome, this image captures both the beauty and prowess of one of the silent hunters of the Canadian forests. Please note: this is a wild owl that was not baited, called, lured-in or manipulated in any way. Also available in our 6-pack of Owl Art Cards! Please contact us directly for quantity pricing. © Copyright 2019 Launstein Imagery | All images © Copyright John, Jenaya, Josiah or Marlise Launstein | All rights reserved.